Europe is our favourite playground. The variety is almost overwhelming to the senses: ancient cities and modern metropolises; beautiful valleys and soaring mountains; pristine beaches and rolling farmland – you name it, and it is all in Western Europe. But one of the most interesting facets to this wonderful continent is the border towns. We have always loved the border towns such as Basel, Strasbourg and even Antwerp – all with their unique blends of cultures from from the bordering countries. Getting around is a breeze. There are great roads everywhere and all are well mapped. Today’s technology allows us to bring our own GPS with all the European countries built in and ready to go. And for those who are technology minded, internet access is available in many coffee shops, pubs, restaurants and hotels all around the Continent. As always, our advice is to find a place you like and stay a few days. Get to know the town like the locals, and take some tours of the area to see what else is around. You will be amazed how much a part of a place you will feel when you get to know some of the locals and make new friends. Hvar, an island in Croatia. Even though many of the countries are now members of the European Union, Eastern Europe is now being discovered by many western travellers, especially from the US. But great experiences await, and the really good news is that prices are generally well below those in Western European countries. While each country has its own unique identity, some remind us of other places we have visited. Croatia, for instance, has a distinctly Italian flavor in many areas. We are still looking forward to having the opportunity to experience more of this interesting part of the world, however we have spent several days in Croatia, Hungary, Slovenia and the Czech Republic. Each stands out for different reasons. 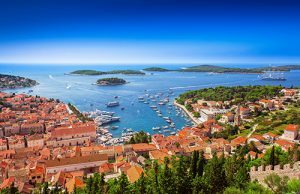 We were impressed especially with the seaside towns and near-coastal areas of Croatia, the sheer beauty of Slovenia and the grand elegance of the cafe society in Prague, Czech Republic. We also spent a very pleasant evening at the opera in Bratislava, Slovakia, which was offered as a side tour from Vienna. It was great, and the price was a fraction of what a similar experience in Vienna would have cost. Our advice is, as always, go with the reviews first when planning your trip. This is especially true in Eastern Europe where sometimes the accommodations don’t quite turn out as advertised. We usually choose a bit higher grade hotel there, generally looking for 4+ star places. But wherever you say, you will enjoy yourself and probably end up saving some money in the process! Most of all – enjoy yourself and go make some memories!